My initial thoughts regarding the logo was something I thought of in the summer when I decided upon this brief. I wanted to use my grandmas handwriting, allowing a traditional and established, almost signature like logo to clarify the handmade qualities of the brand and its garments. I am lucky enough to have pieces of writing by my grandmother, so tried to copy her signature the best as possible. Many attempts are seen below, however the one I was most happy with can be seen directly below. I would also like to try a couple of other logo designs in order to gain better feedback from crits and studio sessions and a better sense of if I am heading in the right direction or not. I scanned in the type I was happiest with and drew out the letters. Three examples of these can be seen below. The top one was traced with the pen tool directed from the type scanned in. The further two went through the same process but were manipulated in terms of weight of the stroke used. These 3 were then further manipulated with straightening the letters out, and kerning, before adding shapes, borders, lines and additional body copy for example. 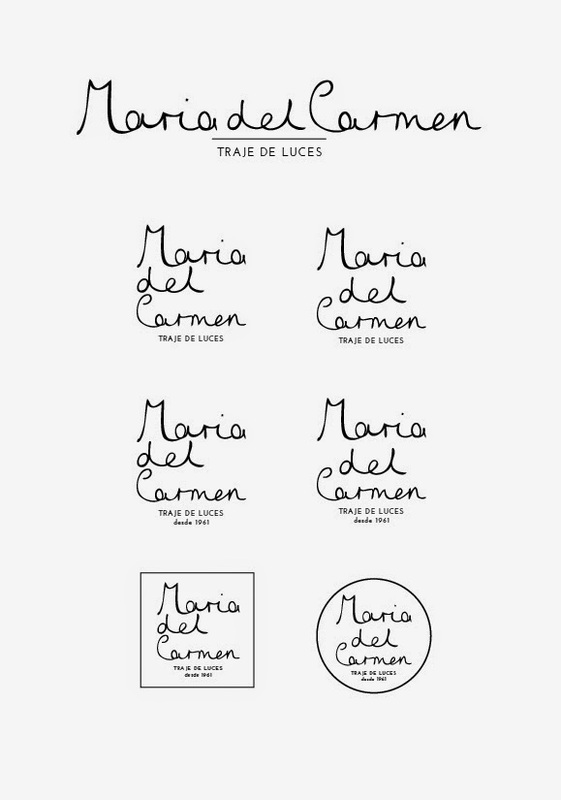 I wanted to gain a broader sense of logo designs, experimenting with the type drawn out. 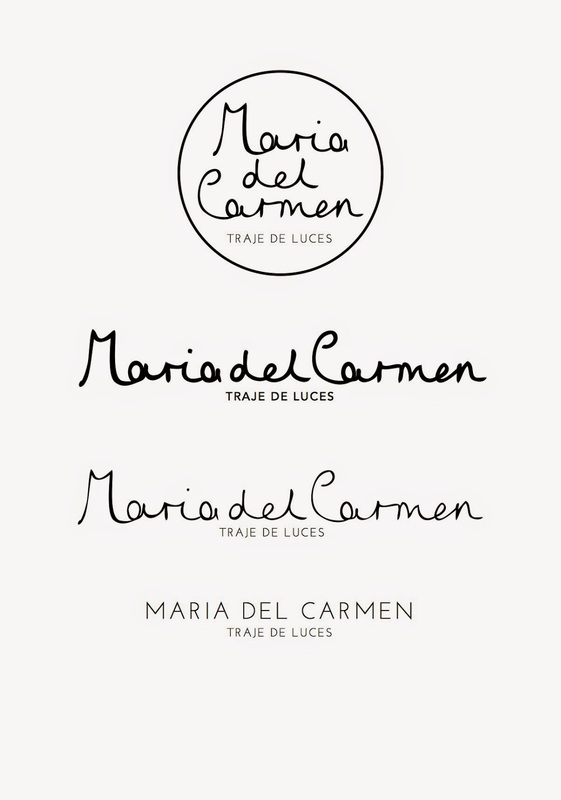 'Traje de Luces' translating to maker of the suit of lights/suit of lights tailor, was then placed also adding a contrasting typeface adding depth and a contemporary edge to tradition. 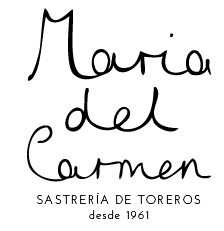 This typeface Josefin Sans was also used for 'Maria del Carmen' to gain a sense of a different aesthetic and tone. I feel it is possibly too clean and modern for this brief, however want to develop the ideas I have here more, and set-up a crit regarding the logo design and a chosen direction to push forward for a final design. Below shows the further development of the logos. Taking the script which has been developed in different weights, I began to further manipulate these using different hierarchies, subtitles, placement and layout. I also began playing with 'desde 1961' translating to 'since 1961' to add a touch of establishedness, however once I had a little crit and got feedback from David and Alex, it was suggested to take this out not to suggest to the audience when the brand was derived. I am playing on the fact it is an established brand with clients, which hasn't had any official branding, and worked solely by word of mouth, and being brought up with the bullfighting traditions. I particularly liked the 2nd and 3rd logo down on the right hand side, and wanted to take these further with development. I really liked how the placement of the 'Maria del Carmen' was much vertical rather than it being placed horizontal. I felt this would work better with business cards and the other branding elements, as well as being used at a larger scale. Below shows another series of developments, using a classic serif font to compare against the script and sans serif used. 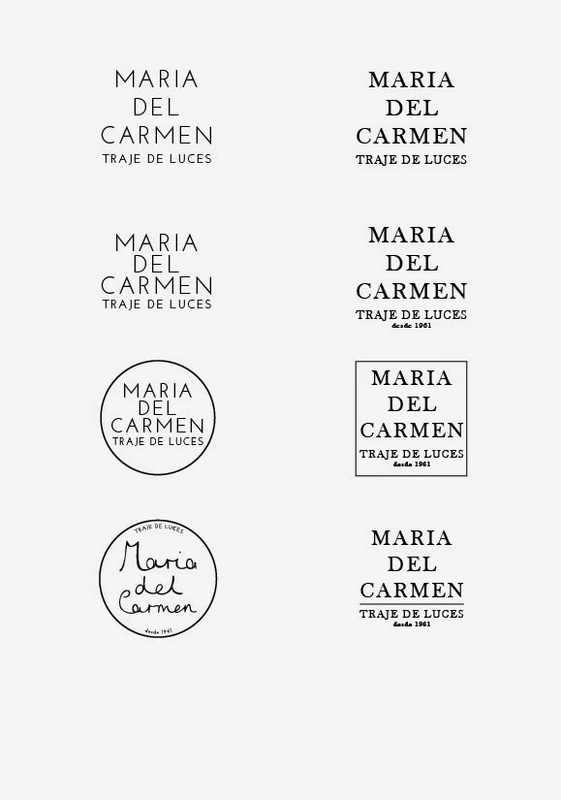 I felt it looked masculine but would be a more suitable aesthetic for Spanish foods for example. I really feel like the signature used reflects a personal touch of the brand, as well as reflecting the Spanish tailoring. I also tried to preferred logo from above in a circular stamp like border, however again felt this wasn't the best aesthetically, and wasn't the most legible or readable. I took the preferred logo and wanted to develop this further. 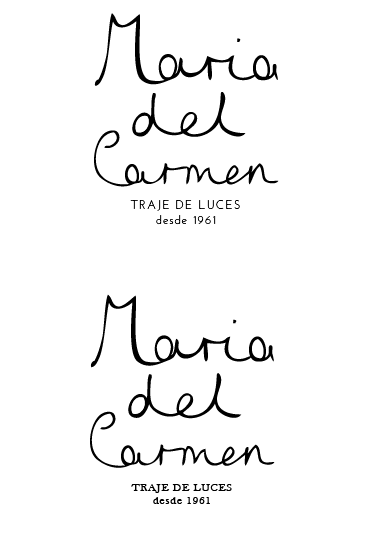 I had a crit as mentioned with graduate David Gaskell, and it was noted by him that the 'maria del carmen' signature with a higher stroke size was much prominent and stood of the page. I had mentioned I would potentially like to experiment foiling these due to the colours and concept behind the term 'suit of lights' or 'traje de luces' and decided that it would be better to use the bolder logo if I would like to foil. Below shows the two logos I chose to develop into final logos. Whilst translating videos which I have previously posted, I came across the more accurate term for Matador Tailor - Sastre or Sastreria. 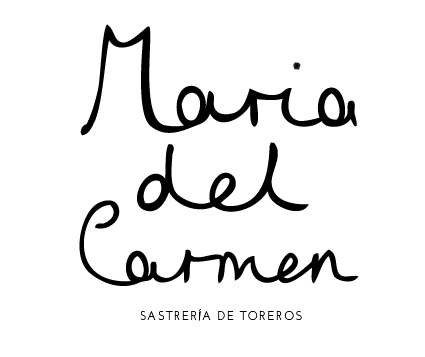 I therefore confirmed with my dad which was most apt, and I then changed the terminology to 'Sastreria de Toreros' from 'Traje de Luces'. Above shows the signature in a bolder stoke size, along with removing 'desde 1961'. I altered the point size of the subtitle also to ensure that this was no larger in width to 'del' keeping proportion in line. I am happy with this logo at this stage, and will use this as the project moves forwards, and develops into the other branding and identity elements. I asked Alex Dyson his opinion on the signature which is my grandmothers signature, and he stated, "without any offence it reminds me of a stereotypical piece of Spanish handwriting"' only being told the basics of the brief. Alex lived in Spain so I do consider his opinion. So therefore I do believe I am on the right track!